이 소설은 독일어로 번역된 박경리씨의 첫 번째 작품이다. 1962년에 발표된 『김약국의 딸들』은 1860~1920년을 시간적 배경으로, 남해안의 작은 항구도시인 통영을 공간적 배경으로 하여 한약방을 운영하는 김성수와 그의 아내 한실댁, 그리고 다섯 딸들의 운명을 다루고 있다. 이 작품은 인물들의 성격과 열정에 대한 매혹적인 묘사를 통해 한국의 가족구조를 비롯한 사회적 삶의 모습을 잘 보여주고 있다. 이 작품에 나타난 한국사회의 인간관계 및 문화적 특성들은 작품의 시간적 배경이 1900년대 초반을 전후한 시기임에도 불구하고 오늘의 그것들과 깊은 연속성을 가지고 있다. 대화의 형식, 식생활 습관, 주거형태, 권위․질서에 대한 사고방식, 결혼식, 장례식, 제사, 무속신앙 등의 한국의 일반적인 문화적 특성들은 다른 문화권에 속한 독자들에게 이국적 정감을 불러일으킬 뿐만 아니라 정열, 사랑, 증오, 정절, 배신, 기쁨, 고통, 질병, 사망 등과 같이 어느 사회에서나 공통적으로 볼 수 있는 인간의 감정과 운명을 대변해 주는 독특한 등장인물과 조화를 이루면서 긴장감 넘치는 이야기를 엮어내고 있다. First ever Park Kyung-Ni novel to be translated into German, The Curse of Kim’s Daughters (1962) unfolds through the period between 1860 and 1920, over the fate of the herb apothecary Kim Seong-Su, his wife Han-sil and their five daughters living in the small port city Tongyoung by the South Sea. The author paints an enchanting picture of character, ardor, and eventually, the Korean and social family. Despite its timeframe of the early 1900’s, there exists continuity between past and present culture and human relations in Korea. Korean attributes such as conversation format, eating habits, living quarters, weddings, funerals, sacrificial rites, shamanism and perception of order and authority bridges across to foreign readers, weaving the unique allegory of universal humanity of love, passion, hate, devotion, betrayal, joy, pain, illness and death into a tense symphony. 『내 영혼의 우물』은 인간의 실존 문제를 명쾌하게 간파하여 자신을 되돌아보게 하는 최인석의 소설집으로 제 3회 대산문학상 수상작이기도 하다. 이 책에는 표제작인 「내 영혼의 우물」을 비롯하여 「새, 떨어지다」「세계의 바닷가」등 세 작품이 실려있다. 번역자인 김선희씨는 “이 작품은 유토피아를 동경하는 인간의 실존 문제를 작가 특유의 친숙한 문체에 아이러니와 우연성을 가미시켜 그려내고 있다”면서 “한국적 분위기가 짙게 담겨져 있기는 하나 독일 독자들이 공감대를 형성할 수 있을 것”이라고 번역소감을 밝혔다. 미델하우베 출판사는 50여년의 전통을 가진 뮌헨의 대표적 출판사이다. 붉은 바탕위에 검은 눈을 넣은 표지가 인상적이다. The Third Daesan Literary Award novel, Der Brunnen Meiner Seele (‘My Soul’s Well’) penetrates ontological questions and brings about self-reflection in three fictions, My Soul’s Well, Ein Vogel, Der Faellt, and Am Strand der Welt. Translator Kim Sun-Hi describes it as a book of irony and contingency written in the author’s familiar phrasing of the existential human wish for Utopia. True, the Korean touches are strong, but German readers will not find sympathy difficult. Middelhauve has published for over 50 years and continues to be a distinguished press in Muenchen. The book features an impressive cover-art of a black eye over a red background. 『외딴방』은 열악한 환경 속에서 문학의 꿈을 키웠던 작가의 사랑과 아픔을 담은 자전적 소설이다. 열여섯에서 스무살까지를 배경으로 한 영혼의 외롭고 진지한 행로를 따뜻하게 포용하고 있는 이 소설은 감동적인 노동소설이면서 동시에 뛰어난 성장소설이다. 고향을 잃고 대도시에 나와서 정직하고 성실하게 살아가면서도 고통을 받던 얼굴 없는 사람들의 삶을 또렷하고 형상화하고 있을 뿐만 아니라, 노동자가 아닌 예술가로서 그것을 어떻게 표현해내야 하는가를 고뇌하는 소설이라는 평을 받았다. ‘시적인 소설가’라고 불리기도 하는 작가 특유의 감성적이고 주관적인 문체가 돋보인다. The biographic novel Das Zimmer im Abseits (‘The Solitary Room’) movingly recaptures the love and suffering of the author who dreams of literature even under poor conditions. This book, both a touching labor book and a brilliant bildungsroman, warmly embraces the lonely and serious path of a life in the years between 16 and 20. Summoning faces and lives of those who, on losing their homes, move to the city and suffer even while living honest lives, The Solitary Room, agonizes over how to best express all the complex elements, not as a worker, but as an artist. The sensitive and subjective style unique to the writer sometimes referred to as the ‘poetic novelist’ emerges glowingly in this particular piece. 『광장』은 남북간 이데올로기 문제를 본격적으로 다룬 최인훈의 대표작으로 한국 대학생들에게 있어 필독서로 자리잡고 있다. 1960년 10월 지에 발표된 『광장』은 주인공 이명준의 삶을 통해 분단과 이념의 문제를 정면으로 그리며 남북 모두를 비판적으로 다룬 최초의 소설이다. 스스로도 『광장』을 대표작으로 꼽고 있는 최인훈은 이후 다섯 차례나 개작하였고 그 때마다 이 작품은 최인훈 문학의 ‘표준점’ 역할을 하였다. 번역자인 김희열 교수는 “이 작품에 나타난 분단과 이데올로기 문제는 독일도 역사적 체험을 공유한 바가 있어 독일어권 독자들의 공감대를 얻을 수 있다고 확신하기 때문에 이 작품을 번역하게 되었다”고 밝혔다. 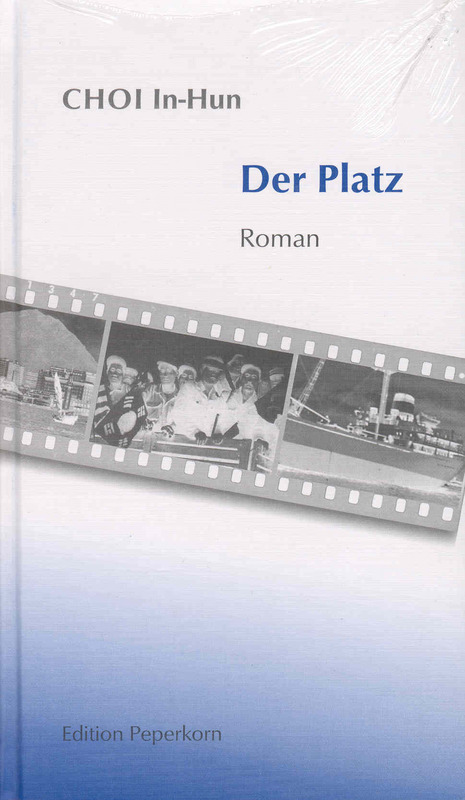 Choi In-Hun’s masterpiece Der Platz (‘The Square’) fast emerges as required reading for Korean university students due to its treatment of the North-South question of ideology in earnest. Published in the journal ‘Saebyuk’ (‘Dawn’) on October 1960, The Square follows the life of the protagonist Yi Myung-Jun, and is the first ever novel to attack, so forthright, both North and South for the partition and difference of ideology. Choi himself calls The Square his best work, adapting it five times, and on each occasion, this has been the measure of standard in Choi’s opus. Translator Kim Hi-Youl revealed he chose this text in faith that German readers, as they too have had the experience, will sympathize with the partition and ideological conflict appearing in the novel. 지난 1996년 주어캄프에서 초판이 발행되고 올해 ‘주어캄프 세계시인총서: 세상의 바람 Poesie in der Bibliothek Suhrkamp: Wind der Welt’의 하나로 재발간되어 주목받는 책이다. ‘세계시인총서’는 20세기 저명한 작가들의 1천3백여 작품을 수록한 ‘주어캄프총서’ 중에서 주요 시인의 시집만 따로 소개하는 시리즈로 지난 7월 고은 시인을 포함한 10인의 시집 10권이 첫 선을 보였다. 이번에 이 총서를 통해 소개된 10명의 시인 중에는 사뮈엘 베케트, 요셉 브로드스키, 파울 첼란, 두어스 그륀바인, 비스와바 쉼보르스카 등이 포함되어 있다. 1995년 지원. Die Sterne… printed in 1984 Korea, exemplifies Ko Un’s nonpareil artistic maturity. In this compendium of poetry by the immense, prolific, forest-like world of Ko-Un, the 1980’s emerges via strong artistic intention while inner beauty blooms. Sixty three buds, in fact, make up this particular forest of 107 pages: works include Deul-Bap, The Bellflower, March, From Heaven and Earth, footnoted and expounded with a forward introduction to the poet himself. 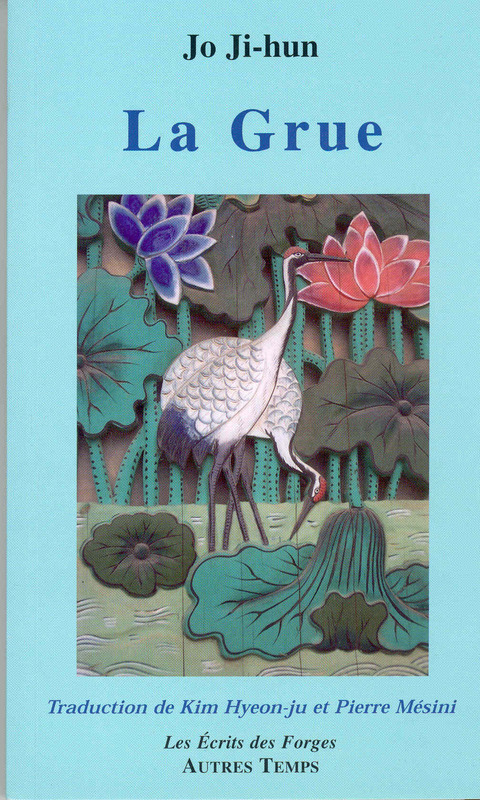 It is the second Korean book of poems printed by the famed German publisher, Suhrkamp Verlag, since Kim Ji-Ha’s Yellow Earth in 1984. 이 소설은 독일의 펜드라곤 출판사에서 새로이 시작한 '한국작가선시리즈' 첫 번째 작품으로 소개되었다. 왕성한 활동을 하고 있는 중진작가 김원일은 한국전쟁과 분단에 관한 자신의 체험을 토대로 이러한 체험에서 생겨나는 인간적인 비극을 자주 다루고 있는데 『바람과 강』은 이러한 그의 특성을 잘 보여주는 소설이다. 이 소설은 청년시절 높은 이상을 가지고 만주에서 일본의 압제에 항거하기 위해 희생적으로 투쟁했지만 결국 실패한 국외자(outsider)의 삶을 영위하게 되는 주인공 이인태의 삶의 역정을 그린 작품이다. Wind und Wasser(Wind and River) Kim Won-Il (Author)/ Ahn Sohyun, Heidi Kang (Translators)/ Germany: Pendragon, 1998 Released by the German Pendragon, Wind und Wasser opens an additional chapter in Korean-German translations as the premier volume in the newly begun Korean Writers Collection Series. The assiduous Kim Won-Il often depicts human tragedy ensuing from ordeals of war, and this book is, incidentally, based on his Korean War and partitioning experience. The story revolves around the vexation of protagonist Yi In-tae, who, as a young idealist, hurls himself into the resistance fight against Japanese oppression in manchuria, only to fail and live an ex-patriot life. 서울대 독문과 임종대 교수가 번역하고 함부르크에 거주하는 독일 시인 유르겐 아벨(Jürgen Abel) 씨가 윤문한 『Ein Tag voller Wind』에는 『내일의 노래』에서 53편, 『이렇게 소라껍질 을 찾네』에서 15편 등 총 68편의 시가 실려 있다. 고은 시집이 독일어로 번역되어 단행본으로 출판된 것은 지난 96년 주어캄프에서 발간된 『Die Sterne ber Dem Land Der Väter 조국의 별』에 이어 두 번째다. 제 1회 대산문학상 수상작인 『내일의 노래』는 30여년을 시작(詩作)에 바친 고은 시인의 사람과 역사에 대한 탐구와 고뇌의 흔적이 담긴 시집으로 존재론적인 사유와 합일, 사회 참여 등 삶의 모든 측면을 문학적으로 형상화했다는 평을 받았으며 『이렇게 소라껍질을 찾네』는 고은의 시 중 사랑을 테마로 한 100편을 골라서 정리한 것이다. 1994년 지원. Ein Tag Voller Wind knits 53 poems from Songs of Tomorrow and 15 from Finding Seashells Thus, making a sum of 68 Ko Un works. Award winner (First Daesan Literary Awards) Songs of Tomorrow chronicles 30 years versification of history and mankind, and attests to his research and hardship. Encompassing all kinds of poetry genres ranging from the simple traditional to the modern experimental, long and short, epic and lyric, narrative and not, his works deal with ontology, unification, and social participation—his is a literary personification of all things. Finding Seashells Thus recollects 100 Ko Un poems under the theme ‘love’: his love songs of Buddhist mercy go beyond its boundaries to attain an eternal worth. 2002년 대산문학상 수상작인 『花開』는 한국 민주화 운동의 상징적 존재인 김지하 시인이 민주화 운동 후유의 시대의 울적과 긍정을 직절적이고 열정적으로, 그러나 단순화하지 않고 역설과 모순으로 표현한 시집이다. 또한 1990년대 이후 민주화 운동에서 환경운동과 생명사상으로 관심사가 이동한 시인의 변모를 잘 드러내고 있기도 하다. 특히 이번 번역서는 시편마다 재불 수묵화가로 명성이 높은 방혜자 씨의 그림을 곁들여 시화집(詩畵集) 형태로 출간된 점이 눈에 띈다. Voix d'Encre는 프랑스의 시집 전문 출판사이다. 2004년 지원. Readers typically have a pretty good idea of what work by Ji-ha Kim is going to be like. And his work isn’t far from what is expected, certainly not from poetry coming from the conflict-ridden eighties, nor for poems from a time rich in lyricism. But at the same time, this collection is sufficient to puzzle such readers. Without a hint of stubbornness or compulsion, the poems here simply gently convey the quiet, but deeply resonating echoes of life, existence, and the universe. It was a 10th Daesan Literary Awrds Winner. 거짓된 낙관보다는 진실된 비관을 존중하며 한국 사회의 모순을 아프게 직시하는 작품을 꾸준히 발표해 온 중견 소설가 최인석의 대표작이 불어로 출간되었다. 『내 영혼의 우물』은 혼탁한 세상과의 갈등, 유토피아에 대한 인간의 본능적 욕구와 좌절을 삶의 현장과 밀착된 다양한 소재와 감칠맛 나는 문체로 그려낸 문제작으로 1995년 대산문학상을 수상해 43살의 신진작가이던 최인석의 이름을 널리 알리게 한 대표작이다. 당시 신앙, 자유, 사랑 등 드물지 않은 소재를 다루면서도 이야기를 인간실존의 탐색으로 승화시켜 이끌어 가고 있다는 평을 받았던 이 소설집에는 총 6편의 소설이 수록돼 있는데 본 번역서에는 이중 「세상의 바닷가 Le rivage du monde」 「세상의 다리 밑 Sous le pont du monde」 「내 영혼의 우물 Le puits de mon a＾me」 등 3편의 중단편이 번역돼 있다. Comprised of six short stories, this is a work which uses the surreal, violent daily life of a prison to illustrate the desires and frustrations of humanity. Choi In-seok is a writer who prefers honest criticism to false optimism. With his rich, flavorful style, Choi In-Suk uses a variety of subjects taken from real life to express the innate human desires and frustrations as we search for a utopia while dreaming of flying freely from the conflicts of this corrupt world. Winner of a Third Daesan Literary Awards, it has also been translated into German, where it is being well received. 지난 96년 소개된 박목월의 『Le Passant 나그네』에 이어 오트르탕(Autres Temps) 출판사에서 소개되는 두 번째 청록파의 시집이다. 조지훈 시집 『청록집』, 『풀잎 단장』, 『조지훈 시선』, 『역사 앞에서』, 『여운』 등에서 번역자들이 110여편을 선정하여 번역했다. 특히, 책의 머리에는 조지훈의 개인사를 당시 한국사 비교 수록하여 한눈에 그의 일대기를 살필 수 있도록 세심한 배려를 하였다. 박목월, 박두진과 함께 '청록파 시인'으로 일컬어지며, 이들의 공통적 주제였던 '자연'에 대한 추구와 함께 관조적이며 고전적인 품격의 시를 독자적으로 형성한 조지훈의 시는 자연을 바탕으로 인간의 염원과 가치를 성취하고자 하는 공통된 주제로 한국시의 새로운 면모를 선보일 것으로 기대된다. 페이퍼백 178페이지. 2001년 지원. His subject matter, the classical scenery of the 1040’s, gained attention when Jo Ji-Hun chose it as his medium for elegant song of national sentiment. Dubbed Cheongnokpa (a circle of three nature poets who came to light as a result of recommendation from the journal, ‘Sentence’) since the publication of ‘Cheongnokjip (a collection of the trio’s works named after Park Mok-Wol’s poem Cheongnoru’)’ with Park Du-Jin and Park Mok-Wol, Jo Ji-Hun has since been central in modern Korean poetry. This edition houses 110 odd poems chosen from his volumes ‘Cheongnokjip,’ ‘Pullip Danjang,’ ‘Collected Poetry of Jo Ji-Hun,’ ‘At the Foot of History’ and ‘Lingering.’ Special care went into the forward where the poet’s personal history runs alongside national history, making it an excellent guide to his biography. With this second Cheonnokpa volume of poetry to come from the French publishing house Le Grue with the first, Park Mok-Wol’s Le Passant, in 1996, Korean poetry will show a new face under the constant theme of human wish and fulfillment where nature is background. 식물들의 사생활』은 재단의 2001년 한국문학 번역지원을 받아 번역되었는데 재단은 책 출간을 앞둔 지난 6월 중순 작가 이승우와 번역가 최미경의 작품낭독회 및 언론사 인터뷰 등을 파리에서 줄마출판사와 함께 개최한 바 있다. 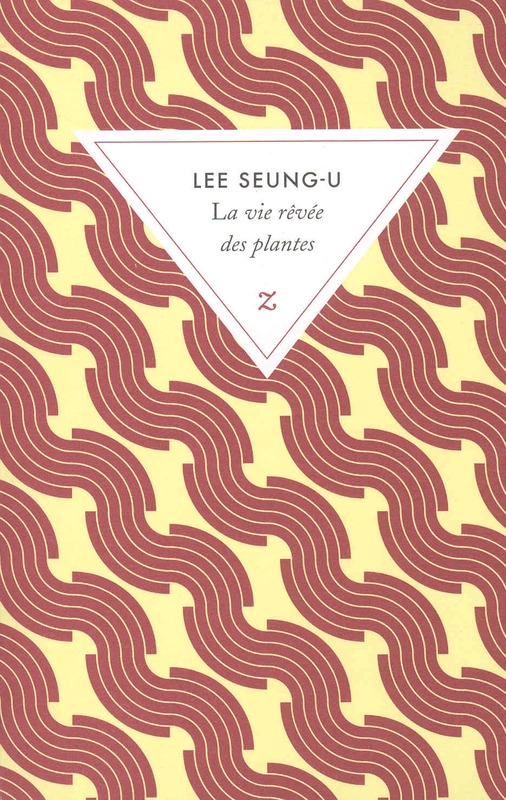 프랑스의 줄마(Zulma)에서 출간된 이승우의 장편소설 『La Vie Rêvée des Plantes 식물들의 사생활』이 프랑스 언론의 대대적인 찬사 속에 한국 소설로는 유례가 드물게 출간 한 달만에 초판 2천5백부가 매진되는 돌풍을 일으켰다. 프랑스 최대의 판매부수를 자랑하는 일간지 ‘르 피가로 Le Figaro’는 지난 9월 14일자 문화면 머리기사에서 이승우가 “고대신화를 원용하여 영원한 사랑을 주제로 한 아름답고 몽환적인 신화를 만들어냈다”고 찬사를 보낸 뒤 “낭만적인 이미지가 비극과 허무에 대한 도전처럼 사용된다는 점”을 이 소설의 가장 인상적인 점으로 꼽았다. 이승우는 이미 지난 2000년 발간된 대산문학상 수상작 『L'Envers de la Vie 생의 이면』을 통해서 페미나상 외국소설 부문 최종후보작에까지 오르는 호평을 받은 바 있어 프랑스 문단에서 한국소설을 대표하는 브랜드로 자리 잡을 가능성을 엿보게 하고 있다. This is a novel by Lee Sung-U, who was a 1st Daesan Literary Awards winner with Another Side of Life in 1993. A young man hires a prostitute for his older brother, who has a deformed leg. Before this, his mother had carried the older boy on her back, taking him back and forth to the red-light district. There is one woman there who is loved by both brothers. The older brother becomes incensed when he feels his brother’s love coming from this woman, and the reason that the pain of the crippled boy is felt more acutely by his mother is that he was her child with an ex-boyfriend whom she’d never forgotten. This work deals with people who love a lot, and love well. 한국 근대문학사가 낳은 불세출의 시인이자 작가인 이상의 시선집이다. 스스로를 “박제가 되어버린 천재”라 불렀거니와, 문학을 통해서 인간 고통의 근원을 끊임없이 발견하려 했던 천재 작가였던 그의 문학은 해외에서도 많은 관심을 받고 있다. 이를 반영하듯 이상의 작품은 여러 언어로 번역, 출판된 바 있고, 줄마에서도 그의 단편집 이후로 두 번째 작품집을 출판했다. 이상의 시세계를 전체적으로 살펴볼 수 있도록 시 전집의 형태로 구성되었다. 2001년 지원. Yi sang was an unparalleled poet and writer, born of modern history of Korean literature. Famously calling himself "the stuffed specimen of a genius," he was indeed a strange (yi sang in Korea can mean 'strange')genius forever searching for the source of man's pain and suffering. Launching his literary career in 1931 with A Strange Reversible Reaction, he lived to 26 years and seven months - a life too short and not at all happy. Despite personal circumstances, his works Crow's Eye View, Wings, Spiders And Pigs, Meeting and Parting revolutionized Korean literature. The defining premises of is literature are as follows: grotesque states of distortion and unrest; distortion and / or play of numbers; schizophrenia and excess self-consciousness; and belief in an irrational world. Yi Sang: Collected Poems archives Yi Sang poetry for a full overview on the Yi Sang poetic oeuvre. 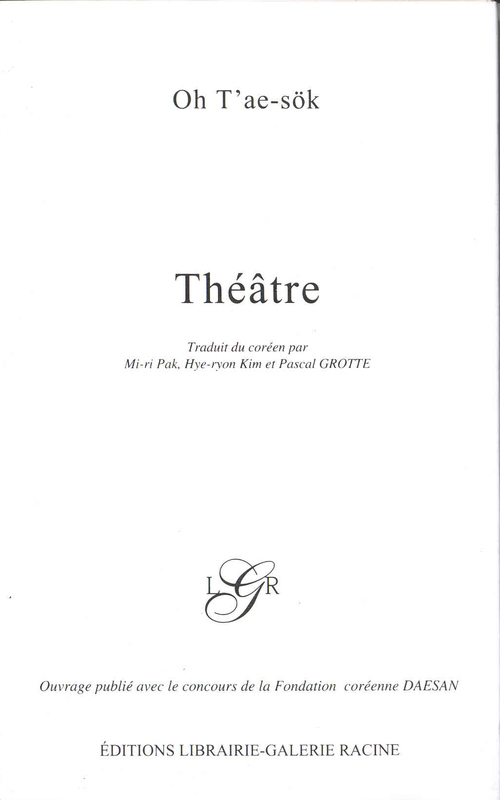 Oh Tae-Sok(Author)/Park Mi-Ri, Kim Hye-Ryon, Pascal Grotte(Translators)/France: Racine,2004 By Oh T'ae-Sok, the most illustrious playwright and producer in the contemporary scene, this book is a compilation of his three seminal plays. Lauded as the best work of 20th Century Korea, Life Cord recounts the Joseon Dynasty court-secret tragedy of King Danjong. Intimacy between Father and Son also finds inspiration from the most puzzling of Joseon mysteries: King Yougjo's execution of his own son (aka the death of Crown Prince Sado). The 1993 First Daesan Literary Awards winner of best drama Why Did Shimchong plunge into the Indangsu Twice? tells the story of Shimchong, who once threw herself into the Indangsu. She is reborn into our present world and, experiencing the dark sides of our society, again throws herself back into the indangsu. Compared to the earlier two works, this last is a more allegorical tale. 작가 이인성은 몸에 익어 편안한 방식을 거부하고 힘들지만 독자적인 개성을 추구하는 글쓰기 방식으로 유명하다. 이 소설은 기왕의 소설문법을 과감히 깨뜨리는 실험적이며 자기반성적인 소설을 선보이는 이인성의 처녀 작품집이다. 한국의 대표적인 현대 소설 가운데 하나이면서 작가가 추구하는 소설기법이 프랑스 현대 누보로망 계열 작품들과 비교되는 요소를 많이 갖추고 있다. 작품집 안에는 4편의 독립된 중편이 들어있고 이들은 연속성을 띠기는 하나 연대순서와 상관없이 배열된 것이 특징적이다. 이인성의 작품 중 처음으로 번역되어 해외에 소개되는 것이다. 난해한 원작의 표현성을 가능한 한 그대로 살리려고 노력한 성실성과 필요한 곳에 자세한 설명을 붙여 작품의 내용을 불어권 독자들이 이해하기 쉽게 배려한 점이 돋보인다. 또한 프랑스의 저명한 불문학자이자 평론가인 장 벨멩-노엘이 공역자로 참여한 점, 프랑스에서 일어난 신소설기법인 누보로망 계열의 소설이라는 점 등 프랑스에서 주목받을 만한 요소를 두루 갖추고 있어 기대를 모으고 있다. Yi In-Sung is well known for his writing style, a style that objects to complacency and instead strains for the difficult but, ultimately, the inimitable. Saisons d'Exil a juvenalia, breaks away from past grammar, bringing out an experimental yet introspective novel into light. 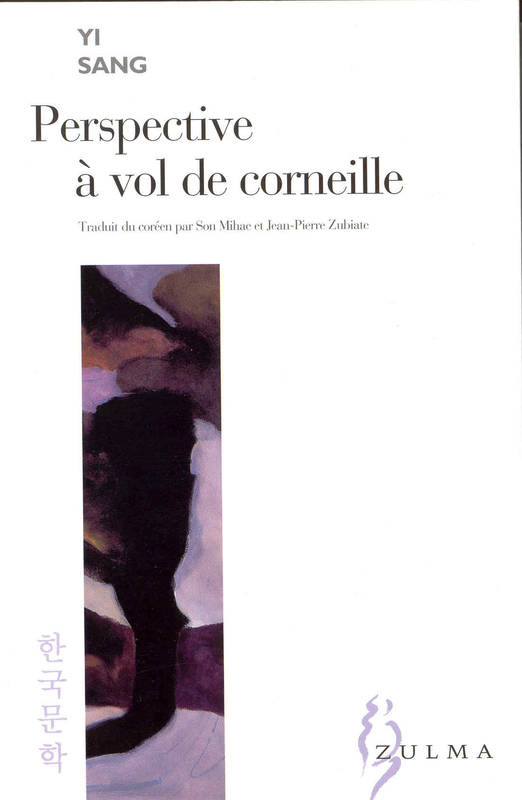 It is one of the few chosen books representative of the modern Korean novel and contains many elements comparative to the modern French nouvelle fiction. Of special note is the arrangement of the four separate medium-length stories which-albeit the textual continuity- reject chronological order. 조선 숙종 때 서포 김만중이 지은 장 편 고전소설로 주인공이 현실 세계에서 이루지 못한 일을 꿈속에서 마음껏 이루고 살다가 다시 현실 세계로 돌아와, 꿈속에서 누리던 부귀영화나 공명은 한바탕의 꿈에 지나지 않음을 깨닫는다는 이야기이다. 『구운몽』은 고소설 창작에 전형적인 모범을 제시하여 소설사의 획기적인 전환을 마련하였으며 고소설 중 대표적인 작품으로 손꼽히고 있다. 2001년에 이탈리아어로도 번역되어 출판되었다. 2000년 지원. 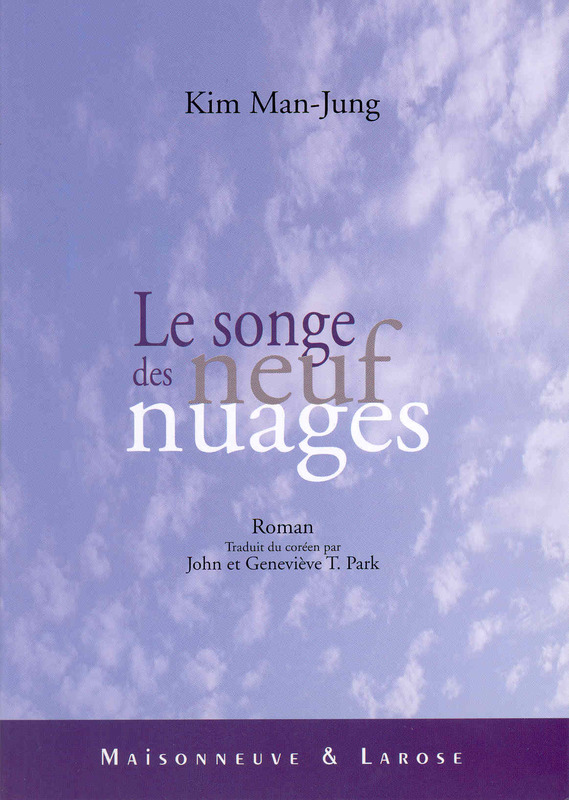 Le songe des neuf nuages (Kuunmong, aka "The Dream of Nine Clouds"), a classical work of fiction written by Kim Man-Jung(Pename: Seopo) during post-Jeseon Sukjong's reign, is widely recognized as an immortal masterpiece among its kind in Korea. The protagonist Song Jin is a former disciple of Buddhist Master YukGwan (literary meaning "Sixth sense"); as punishment for his giving into temptation with eight fairy maidens, he is banished and born again into earthly life with the name Yang So-Yu. Easily passing higher civil service examinations in his teens, the hero quells many rebellions to rise to the highest military command in the land: a General. Yang lives a prosperous life enjoying a succession of love affairs and marriages with eight different-reincarnations of the eight fairy maidens - women, but towards the end of his life he realizes the mutability of being. Presently, attaining enlightenment from the sermons of the Great Teacher, Yang embraces Buddhism with the eight fairy maidens. Though military activity constitutes a small portion in the lifespan of Yang So-Yu, the hero's existence still shares typical features with epics. Le Songe des Neuf Nuages is a dream journey to the conclusion that all human fame and fortune are but a daydream. 이윤택, 오태석에 이어 프랑스에서 노경식 희곡집이 이마고(Imago) 출판사에서 발간되었다. 이 희곡집에는 표제작인 「하늘만큼 먼 나라」를 비롯하여 「서울 가는 길」 「천년의 바람」 등 세 편의 희곡이 실려 있다. 역자는 각 작품마다 작품의 특성, 내용 등에 관한 해설을 붙였다. 번역서 표지에는 북한의 한 관광지 사진을 실었다. 남북 분단으로 야기된 이산가족의 문제를 다룬 「하늘만큼 먼 나라」를 통해 프랑스인들에게 남북 분단의 현실과 아픔을 보여주고자 하였다. 파리 한국문화원에서 열린 출판기념행사에는 프랑스 극작가를 비롯한 많은 문화계 인사들이 참석하여 노경식 희곡에 대한 높은 관심을 보이기도 하였다. 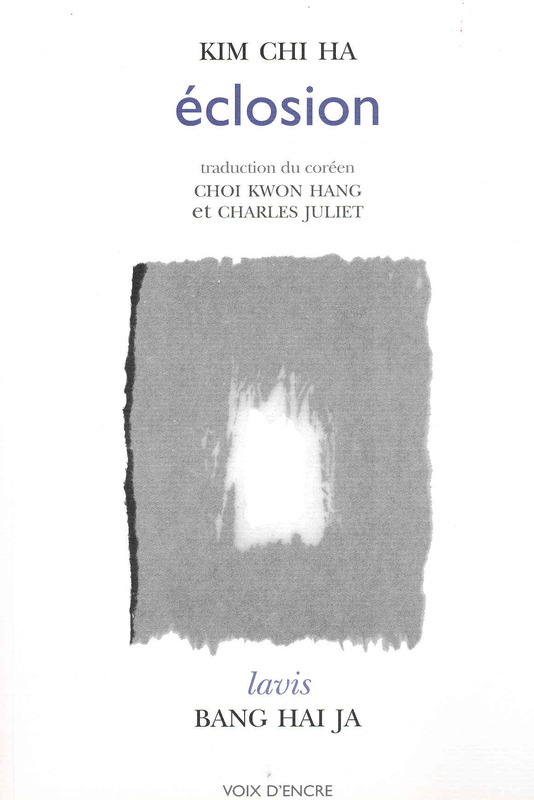 This is a collection of plays published in France following works published by Lee Yun-taek and Oh Tae-seok. This collection includes three plays, including the title work, “The Country as Far Off as the Sky,” along with Le train pour Séoul (The Road to Seoul), and Le souffle des siècles (Winds of Eternity). The translator has added a commentary about the unique features of each play and their subject matter. On the cover of the translation there is a tourist photo of North Korea. 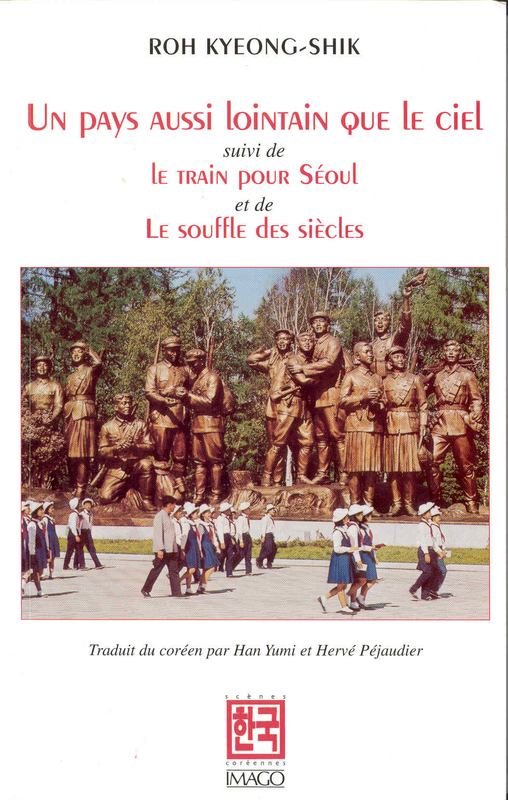 Un pays aussi lointain que le ciel, which deals with the problem of families separated by Korea’s division, is intended to illustrate to French readers the reality and pain of the country’s division. 1958년 으로 등단, 시력(詩歷)으로는 불혹의 나이를 넘긴 황동규 시인은 늘 특유의 감수성과 지성을 유지하면서도 변화를 통한 거듭남을 끊임없이 추구한 시인이다. 95년 제 3회 대산문학상 수상자이기도 한 황 시인은 지금까지 세련된 지성과 감각으로 긴장감 넘치는 언어와 시의 구조를 유지하면서도 청년의 사랑과 우수, 사회 비판, 죽음과의 맞대결, 시인의 정체성 탐구로 이어지는 시세계의 변모를 보여 왔다. 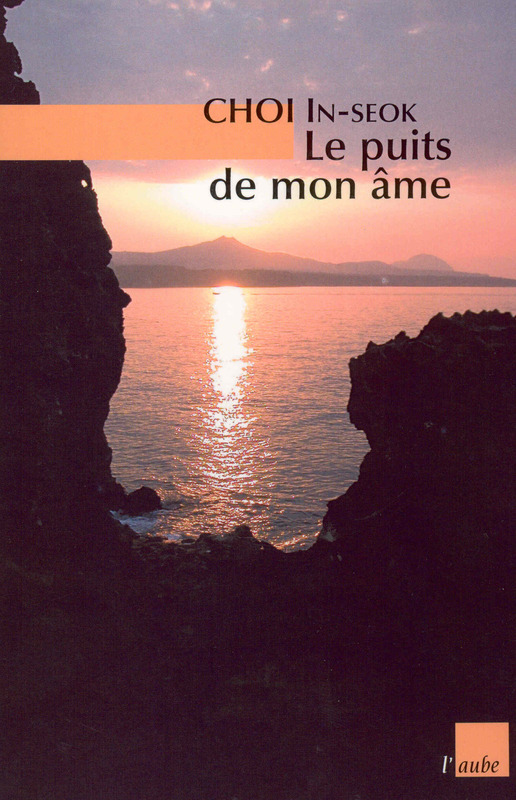 『Les racines d'amour 사랑의 뿌리』에는 황동규 시인의 등단작품인 「즐거운 편지」를 비롯하여 최근작인 「바우아 데비의 그림」까지 40여년간 발표했던 열권의 시집 중에서 시인이 직접 고른 50편의 시가 실려있다. Initiating his literature career with the 1958 publication of October in the ‘Hyondae Munhak’ (‘Modern Literature’) review and winning the Third Daesan Literary Awards in 1995, Hwang Dong-Kyu enjoys more than 40 years of activity in the literary world. He is a poet forever striving for permutation while maintaining his unique sense, sensibility, and controlled tension in his language and structure--even through his metamorphosis of poetic oeuvre from that of love and melancholy of a youth, to criticism of society, to a face à face with death, and finally, to a quest for poetic identity. Les raciness d’amour encompasses 40 years of life’s work: including the juvenelia A Happy Letter, and the more recent Baua Devi, the poet himself handpicked 50 pieces of poetry from a body of 10 volumes. 한국 현대 시사(詩史)의 흐름 속에서 현대적인 서정시 창조의 분수령을 이룬 정지용 시인의 불역 시집이다. 이 책에는 표제작인 「향수」를 비롯하여 「유리창」「바다」「카페 프란스」「백록담」등 『정지용 시집(1935)』과『백록담(1941)』에 수록된 51편의 작품이 한국어와 불어로 함께 실려 있다. 남북 분단의 소용돌이에 휘말려 남북 양측의 문학사에서 다같이 실종된 운명에 놓여 있다가 1988년에야 비로소 해금조치로 겨우 문학적 복권이 이루어진 비운의 시인 정지용은 “부족언어의 순화”를 당대 최고 수준의 기량으로 실천하였던 작가이다. 프랑스 포(Pau) 대학 교수이며 원로 시인인 장 비에스(Jean Biès)는 특별히 기고한 서문에서 “정지용은 세부적으로 인상파적이고, 유머가 넘쳐흐르며, 때때로 세련된 사실주의적 경향을 띠기도 하는 매우 참신한 감각적 이미지즘을 보여준다. 그는 특히 도교 사상과 기독교 사상을 정신적 자양으로 하면서 자연과 신에 대한 깊은 외경심을 절제된 언어로 표현하는 데 뛰어나다”고 평가했다. 한국 현대문학의 선구자로서 30여편의 주옥같은 단편들을 남기고 요절한 김유정의 대표작들이 그가 세상을 떠난 지 60여년 만에 프랑스에서 번역, 출간됐다. 『Une averse 소나기』에는 표제작인 「소나기」를 비롯하여 「가을」「동백꽃」「봄봄」「솥」「아내」「정조」「산골나그네」「땡볕」등 9편이 실려있다. 김유정의 소설들은 주로 농촌 서민들의 모습을 풍부한 토속어와 해학적 수법으로 그린 단편들이다. 번역자인 최미경씨는 “풍자와 해학이 짙은 문체의 효과를 제대로 살리는 데 번역의 역점을 두었다”며 “프랑스 독자들이 한국 현대 문학의 초석을 놓은 김유정의 문학적 가치를 발견하길 바란다”고 말했다. 이 책이 발간되자 프랑스 최고의 일간지 는 김유정의 삶과 작품세계를 자세히 소개하였고, 등 문화월간지와 주간지 등도 관심을 가지고 보도했다. Kim Yu-Jong died before her time, leaving behind 30 or so brilliant gems. This pioneer of modern Korean literature sees light again after 60 years, her short stories translated and published in France: Une averse includes the title piece Rain Shower, and eight other works (Fall, Camellias, Spring, Spring, The Iron Pot, Wife, King Jongjo, The Hillside Wanderer, Scorching Heat). Rural life becomes animated through Kim Yu-Jong’s humor and language; the translator Choi Mikyung has focused on recreating the same humorous and satirical effect, in hopes that French readers will discover the literary value of this seminal author. Instantly upon its release, the leading French newspaper, ‘Le Monde’ published a detailed report of Kim Yu-Jong’s life and literary oeuvre; newsweekly and culture magazines like ‘BCLF’ also took interest and followed suit. 한국소설계의 거장(巨匠)인 박경리의 장편소설 『시장과 전장』은 『토지』에 이어 두 번째로 프랑스에 소개되는 소설이다. 한국현대사에 있어 가장 지난했던 시절인 한국전쟁 시기를 생생히 담고 있다. 한국전쟁의 참상 속에서도 인간의 숨소리가 느껴지는 시장, 살아있음이 확인되는 유일한 통로인 전장 속의 시장을 사실적으로 묘사하고 있어 한국적 정서의 발로를 확인할 수 있게 해 준다. 1964년 12월에 나온 이 소설은 전쟁과 이데올로기, 민중 등에 대해 60년대 작품으로서는 드물게 객관적이며 진보적인 기록과 해석을 남긴 소설로 평가받고 있다. The second Park Kyung-Li to make entry into France following Toji (‘The Land’), Le marche et le Champ de Bataille incorporates the most difficult time in the history of modern Korea: the period of the Korean War. The market place provides sole opportunity for life confirmation: Park depicts a very real, very Korean picture of the market place where human breath, even during the horror of war, is felt. Rare for a work from the 60’s (the original text being released in December 1964), objective and advanced records and interpretations are provided on the subject of war, ideology, and the people.